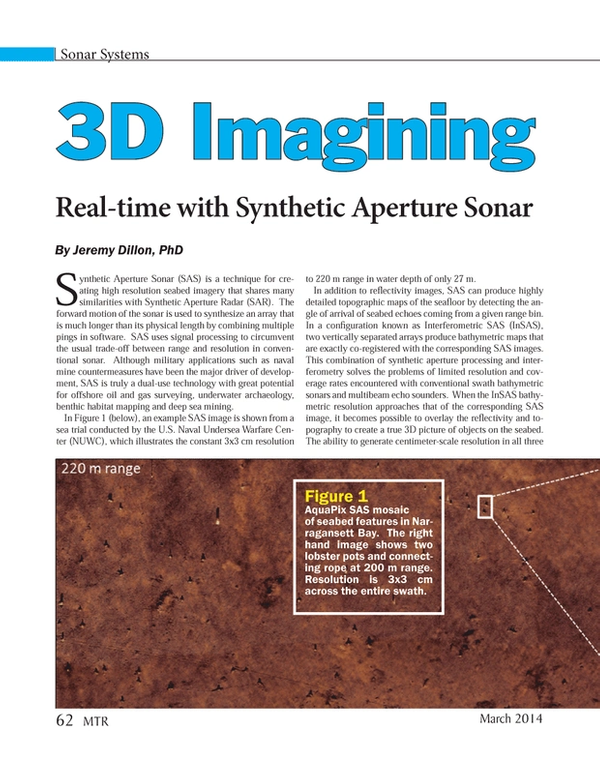 Synthetic Aperture Sonar (SAS) is a technique for creating high resolution seabed imagery that shares many similarities with Synthetic Aperture Radar (SAR). The forward motion of the sonar is used to synthesize an array that is much longer than its physical length by combining multiple pings in software. SAS uses signal processing to circumvent the usual trade-off between range and resolution in conventional sonar. Although military applications such as naval mine countermeasures have been the major driver of development, SAS is truly a dual-use technology with great potential for offshore oil and gas surveying, underwater archaeology, benthic habitat mapping and deep sea mining. In Figure 1 (below), an example SAS image is shown from a sea trial conducted by the U.S. Naval Undersea Warfare Center (NUWC), which illustrates the constant 3x3 cm resolution to 220 m range in water depth of only 27 m.
In addition to reflectivity images, SAS can produce highly detailed topographic maps of the seafloor by detecting the angle of arrival of seabed echoes coming from a given range bin. In a configuration known as Interferometric SAS (InSAS), two vertically separated arrays produce bathymetric maps that are exactly co-registered with the corresponding SAS images. This combination of synthetic aperture processing and interferometry solves the problems of limited resolution and coverage rates encountered with conventional swath bathymetric sonars and multibeam echo sounders. When the InSAS bathymetric resolution approaches that of the corresponding SAS image, it becomes possible to overlay the reflectivity and topography to create a true 3D picture of objects on the seabed. The ability to generate centimeter-scale resolution in all three dimensions has the potential to provide significant improvements in the detection, classification and identification of small seabed objects. For example, Kraken’s INSIGHT software produces co-registered bathymetric maps with horizontal resolution as low as 5x5 cm. AquaPix data from an InSAS bathymetric survey conducted by Australia’s Defense Science and Technology Organisation (DSTO) is shown in Figure 2, which illustrates the enhanced level of detail compared to a conventional hydrographic survey. Over the past decade, Autonomous Underwater Vehicles (AUVs) have evolved from technology demonstrators to commercial products that are routinely used for operational survey work. AUVs offer many advantages compared to towed or ship-mounted systems, such as ease of deployment, reduced need for human intervention and lower operating cost. A further advantage for military operations is the ability to forward-deploy an unmanned system into potentially hostile waters. An AUV solution is particularly attractive for minehunting compared to the conventional approach of towing a sensor through a minefield using a manned surface vessel. However, one challenging aspect of untethered operation is the greatly reduced communication bandwidth between the vehicle and the operator. The volume of data collected during survey missions is typically too large to be transferred through an acoustic communication system while the vehicle is submerged. Removable storage modules allow data to be rapidly downloaded when the vehicle is recovered to swap batteries. However, a bottleneck remains as many hours of data needs to be processed at once. Compared to Remotely Operated Vehicles (ROVs), AUVs have seen much more emphasis on onboard processing and intelligent algorithms for path planning and environmental adaptation. Until recently, AUV real-time InSAS processing has been limited by the available onboard processing power to form synthetic aperture imagery and to generate the corresponding high resolution bathymetry. However, with advances in parallel computing technology and fast algorithms for image processing, it is now practical to perform 3D imaging in real-time using low cost, off-the-shelf Graphics Processing Unit (GPU) technology. One of the advantages of parallel computing is that it is inherently scalable, allowing a seamless trade-off between power consumption and processing speed. Real-time onboard processing ensures that the data downloaded from the AUV is ready for immediate analysis. A further advantage for autonomous systems is that target detection and tracking algorithms can be embedded into the vehicle control system to revisit targets of interest or to adaptively update the mission plan based on survey metrics such as continuity of coverage or image quality. Kraken’s real-time AUV processor performs InSAS 3D imaging twice as fast as raw data are recorded, leaving significant computational resources available for applications such as Automatic Target Recognition (ATR), pipeline tracking, and autonomy. The effectiveness of target classification is improved when high resolution sonar imagery is acquired from multiple viewing angles. As targets become more stealthy, it is desirable to extract as much information as possible from the reflected acoustic waves to minimize the residual risk of misclassification. When a target is imaged with an InSAS, an extremely detailed 3D image can be formed by combining the imagery and bathymetry from multiple views. Recent experimental work with Defence Research and Development Canada has shown promising results using this technique. InSAS images and bathymetry from multiple views of a Mine-Like Object (MLO) were coregistered in a common coordinate system. In geographic coordinates, the orientation of each acoustic shadow varies while the target features remain fixed. The views were summed to produce a multi-aspect 3D image of the MLO without any acoustic shadows. Several structural elements such as lifting lugs were much more visible in the multi-aspect image than in the individual SAS images. Survey operations typically consist of pre-mission planning, deployment and recovery of the vehicle and sensor package, and post-mission processing and analysis of the data that have been collected. Post-mission processing often includes quality control, filtering, geo-referencing, correcting for environmental conditions and creating mosaics of imagery and bathymetric contour surfaces for integration into a Geographic Information System (GIS). While real-time InSAS processing is a significant improvement over post-processing raw sonar measurements, it is clear that the overall work flow can be further improved by migrating post-mission tasks to an onboard processor. Kraken has connected with the software company CARIS to develop such a capability for InSAS with many of the traditional post-mission tasks being executed automatically during the mission itself. In addition to reducing the demands on human analysts, onboard processing can also shorten the decision time for acting on the information gathered during a survey. For example, in amphibious warfare involving a mine threat, it is highly desirable to minimize the time required before troops can be safely landed. The integration of real-time InSAS processing with GIS software is a promising approach for increasing the overall tempo or seabed survey operations. As technology evolves, it is anticipated that traditional survey deliverables consisting of series of images and soundings will be supplanted by GIS databases containing 3D imagery with attributes describing detected targets of interest. Kraken are CARIS are working together to allow InSAS data to flow into CARIS Bathy DataBASE technology, reducing the time taken to generate modern survey deliverables. Ideally, the tools for seabed mapping would be ubiquitous and persistent, with data being collected continuously at a sufficiently high resolution to meet the needs of all end users. The key to realizing this vision is lowering the cost of both platforms and sensors to not only reduce the initial investment required, but also to minimize the financial risk in the event of loss. Large diameter vehicles have been ideal development platforms due to their size (for ease of mechanical integration) as well stability. However, the cost and requirements for launch and recovery can be prohibitive. A recent development at Kraken has been the design of a compact InSAS array, known as MINSAS (for Miniature Interferometric Synthetic Aperture Sonar), that is optimized for smaller diameter low cost platforms such as small AUVs and towed bodies. While there will always be a need for a range of vehicle sizes, the benefits of InSAS technology are now available across a wide spectrum of platforms. Future work will continue to push the limits for surveying with smaller and more affordable platforms, thereby bringing real-time 3D imaging to widest possible group of end users. Jeremy Dillon holds a PhD in physics and physical oceanography from Memorial University of Newfoundland, as well as master’s degrees in mathematics and aeronautics from Carleton University and Caltech, respectively. Previously, he was an instrumentation engineer with the Flight Research Laboratory of the National Research Council Canada specializing in inertial/GPS navigation and distributed real-time systems. His present interests include synthetic aperture sonar, underwater navigation, and repeat-pass interferometry.